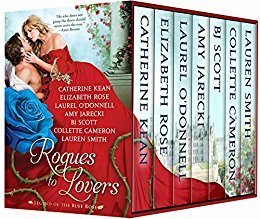 Featuring USA Today, award-winning, Amazon All-Star, and bestselling historical romance authors, the ROGUES TO LOVERS collection includes seven BRAND NEW tales about the rare and mysterious blue rose. Read this thrilling collection to discover the power–and the promise–of the blue rose for yourself. Only available at $0.99 for a limited time! $0.99 on Kindle.